Make A Wish, Making wishes come true! On the 24th of November 2017 we had the opportunity to work alongside Short & Spook to help make 2 little girls’ dreams come true for the Make A Wish Foundation. Short & Spook looked after the design, theming and styling and we looked after the AV, the multimedia installation including; soundscaping and animation and the set. 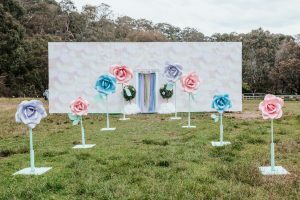 Our brief was to use one space to create a “Magical Unicorn Land” including a unicorn and follow it up with “Fairy Land”. Needless to say, we were excited. It’s not every day that we get an opportunity to make a difference in the life of a child. 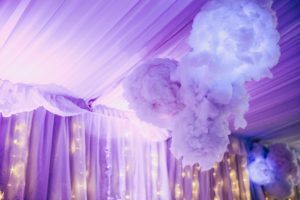 To make this a reality we decked out the marquee with white carpet over the top of green turf, fairy lights under white sheers drapes, projectors, audio equipment and dry ice (to create clouds). 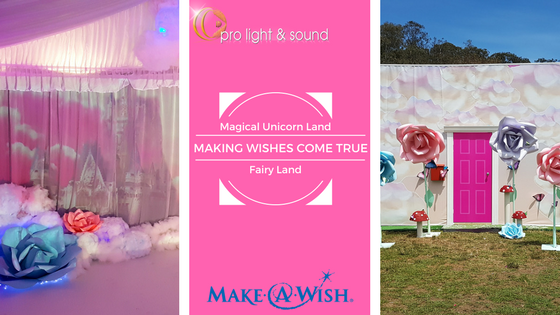 The animation, designed in-house by Pro Light & Sound along with the soundscape transported a little girl into the Magical Unicorn Land she had always dreamed of. The unicorn (a pony dressed to impress) walked through clouds and gave a child a ride she would never forget. 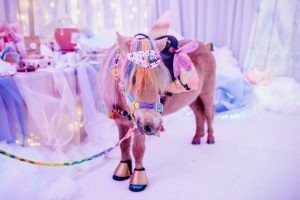 Once the gift of the Magical Unicorn was given, we had 2hrs to transform the marquee into a Fairy Land, complete with a fairy tea party and fairies. 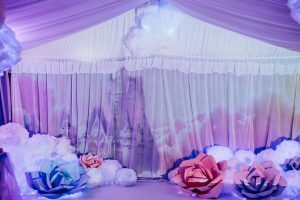 We rolled up the white carpet, took down the projection screen, set up an outdoor tea party and left it to around 50 volunteers dressed as fairies to give another little girl an experience of her lifetime! The outside of the marquee was designed to look like her dollhouse, effectively transporting her straight into the land of her fantasy. This event was reported by multiple media channels including Channel 7, Channel 9 and Channel 10. Although we love media exposure, nothing can compare to the experience of helping making dreams come true! We love making a difference, if you have an event coming up that is making a difference in the world, we want to be involved – so contact us today!